Aldon Smith might be down to his final strike with the 49ers. SANTA CLARA, Calif. (AP) — San Francisco 49ers general manager Trent Baalke is committed to supporting linebacker Aldon Smith like a family member in the wake of his latest legal trouble — and keeping Smith around for the long haul, too. "You continue to work as you would with any family member, you continue to work until they leave you no choice," Baalke said Friday in his annual sitdown with media leading up to the draft. "Does character matter? It does." Baalke repeatedly referenced the word "disappointed" during his 59-minute session when discussing a recent list of off-the-field problems for his 49ers, who lost in the NFC championship game to eventual Super Bowl winner Seattle. 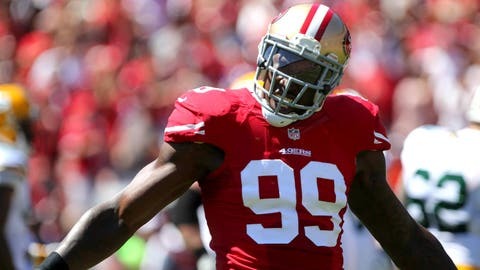 Regarding a May 3 deadline whether to exercise Smith’s 2015 contract option, Baalke gave all indications he hopes to have the menacing pass rusher in a Niners uniform well into the future. Baalke said for 2015, "and ’16, and ’17 and ’18." Smith was arrested April 13 at Los Angeles International Airport. Police say the 24-year-old NFL star was randomly selected for a secondary screening and became uncooperative with the process, telling a TSA agent that he had a bomb. The district attorney has referred the case for misdemeanor consideration. Baalke said Smith is "growing, starting to understand, starting to realize the importance of his own accountability." Yet this follows Smith’s five-game absence last season to undergo treatment after his September DUI arrest. In November, Smith pleaded not guilty to three felony counts of illegal possession of an assault weapon, stemming from a June 2012 party at his home. Investigators say several shots were fired, two partygoers were injured and Smith was stabbed. In the subsequent investigation, prosecutors say detectives found five unregistered, illegal weapons in Smith’s house, including two Bushmaster rifles and an Armalite AR-10T. When it comes to how to best deal with Smith going forward, Baalke said that’s going to be a process. "That’s still being discussed internally," Baalke said. "Everything factors in, you take a look at everything. The one word I can use to describe the situation is disappointing. The important thing is that it’s equally as disappointing to Aldon. "Like all of us, you have the keys to your own car. You make decisions and you live with the consequences of those decisions. Life is a growing process, it’s a growing process for all of us. He knows what needs to be done. We’re all accountable. Each and every one of us in this organization is accountable." The 49ers also still hope to reach agreement on a long-term extension with quarterback Colin Kaepernick before the start of training camp. Baalke said the team would let the investigation play out regarding Kaepernick being linked to a Miami police report earlier this month involving a woman who passed out in a hotel and later woke up in a hospital not knowing how she got there. Kaepernick has strongly denied any wrongdoing via Twitter. "Any time an individual puts himself in a situation that becomes newsworthy, we certainly pay attention to it," Baalke said. "To say there’s no concern, that would probably be a misrepresentation of the facts. At the same time, let’s let this thing play out and let’s see where it goes." In addition, cornerback Chris Culliver — who became famous for the wrong reasons when he made anti-gay remarks before the Super Bowl in February 2013 — has pleaded not guilty to misdemeanor hit-and-run charges and felony possession of brass knuckles from a March 28 arrest. "Are we disappointed we’ve had a string? Absolutely," Baalke said. "One is too many. So if one’s too many, then five or six is way too many. This isn’t something we take lightly. We expect a lot from our football players. We expect a lot from ourselves." He said he is sorry a few players have hurt the reputation of the entire roster and organization. "I’m adamant in my thoughts that this is a good group of men. Have they made some mistakes? Absolutely they have," Baalke said. "I’m not going to sit up here and defend them. There is concern. We hold ourselves to a high standard. The community deserves that. We represent the community." Baalke also addressed his working relationship with coach Jim Harbaugh: "To say it’s always two rams butting heads is so false and misleading. To say there’s no tension would also probably be false and misleading, but it’s good tension." Notes: Baalke said he hasn’t heard from LaMichael James or his representatives to formally request a trade, but knows the RB said on Twitter he could benefit from a change. Baalke’s understanding is James isn’t at the voluntary offseason program because of a new baby at home. … LG Mike Iupati is out of a walking boot for his broken left leg suffered in the NFC title game.